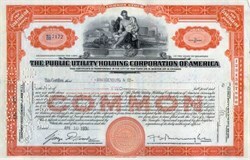 Beautifully engraved certificate from the Public Utility Holding Corporation of America issued in 1930. This historic document was printed by the American Banknote Company and has an ornate border around it with a vignette of an allegorical man writing on a piece of paper. This item has the printed signatures of the Company�s President and Secretary and is over 71 years old. The Public Utility Holding Company Act of 1935 (PUHCA) was passed during the Great Depression in response to the failure of a number of utility holding companies and subsequent investor losses. Many investors were defrauded due to information problems peculiar to the holding company structure. The utility holding company structure undoubtedly helped disguise unscrupulous practices, such as the bilking of subsidiaries through service contracts, inappropriate depreciation techniques, and the use of inflated property values, all of which contributed to the collapse of the holding companies. The Public Utilities Holding Company Act (PUHCA) was enacted to eliminate unfair practices and other abuses by electricity and natural gas holding companies by requiring federal control and regulation of interstate public utility holding companies. These abuses arose from the inability of individual states to effectively regulate the financial transactions of multistate and multi-layered utility companies that evolved in the 1910s and 1920s. From 1900 through 1920 the number of private electric systems grew from approximately 2,800 to 6,500. Starting in 1920, the number of private electric systems declined dramatically primarily because of consolidation and pyramiding of utilities through holding companies. Not only did many operating utilities, in diverse parts of the country, come under the control of a small number of holding companies, but those holding companies themselves were owned by other holding companies. As many as ten layers separated the top and bottom of some pyramids. By 1932, three groups controlled 45% of the electricity generated in the United States. Most highly leveraged holding companies that managed to stay solvent during the prosperous 1920s collapsed after the stock market crash because they could not service their debt. Lower demand for electricity resulted in inadequate revenue to meet fixed obligations. As more and more companies went bankrupt, service deteriorated. While there were advantages to the holding company structure, holding company abuses became apparent after the stock market crash in 1929 when investors lost millions of dollars. During the seven-year period between 1929 and 1936, 53 holding companies with combined securities of $1.7 billion went into bankruptcy or receivership. Twenty-three others were forced to default on interest payments or to offer extension plans. In 1928, the Federal Trade Commission issued a report that listed the abusive practices of holding companies. It concluded that the holding company structure was unsound and "frequently a menace to the investor or the consumer or both." As noted earlier, holding companies operated with no federal and little state regulation. The state utility commissions lacked sufficient authority and resources to control holding companies because companies operated generally in many states and had extremely complex structures. The federal government decided regulatory action was required. The Federal Power Act, which established a federal utility regulatory system, was enacted at the same time as the Public Utility Act of 1935(4); these two Acts were intended to work in tandem. Title I of the Public Utility Act of 1935 is known as the Public Utilities Holding Company Act of 1935 (PUHCA). The company changed its name to General Investment Corporation in 1933. General Investment merged into Foundation Industrial Engineering Company in 1942 whcih recapitalized as Stokely Foods Inc in 1943. They subsequently merged into Stokely - Van Camp Inc in 1952 and then merged into Quaker Oats Company in 1983.